17 July 2018 – London, UK – New global research reveals that service contract leakage in the energy and utilities sector remains unnecessarily high, according to new global research, “The Rise of Asset and Service Data Gravity”, conducted by Vanson Bourne, commissioned by field service management specialist, ServiceMax from GE Digital. 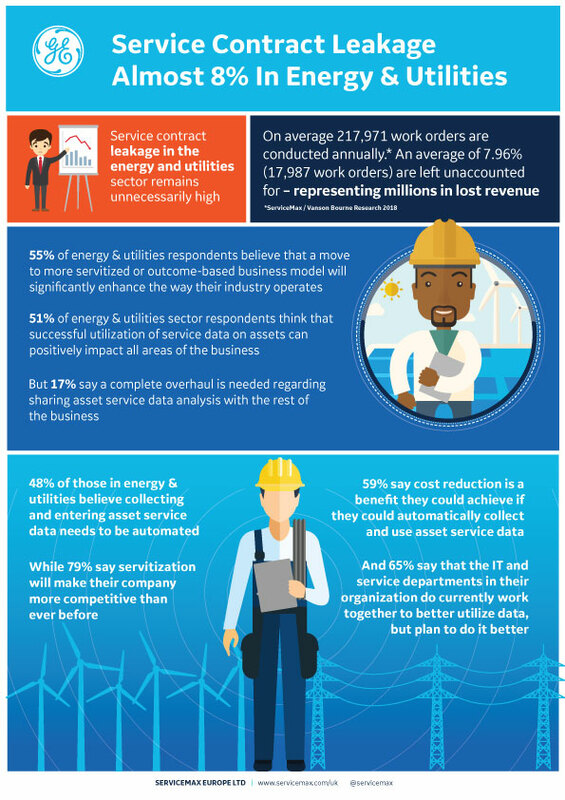 In addition to missing service work orders, representing millions in lost revenue across the industry, there’s a growing desire for the Energy and Utilities sector to move to servitization – also known as outcome-based services. By integrating services with products, companies can create bundles that are of greater value than products alone. This press release was distributed by ResponseSource Press Release Wire on behalf of Devonshire Marketing in the following categories: Business & Finance, Manufacturing, Engineering & Energy, Computing & Telecoms, Construction & Property, for more information visit https://pressreleasewire.responsesource.com/about.